SBB staffers in Singapore heralded the new Year of the Rat with much gusto and a lot of yummy grub. Suffice it to say that a five course lunch and Yu Sheng “Toss Up”, later, we are satisfied at having begun the News Year with wonderful people and are expecting tonnes of prosperity coming our way... steel wise!!! Singapore is a melting pot of global cultures. 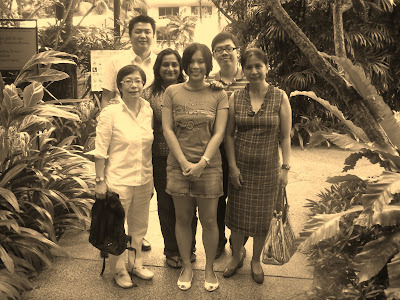 Indians, Chinese, Malays, Indonesians, Europeans, all seem to effortlessly harmonize their lifestyles in the garden city. Different ways of life have been modified over the years to build up a singular culture uniquely Singaporean. As such, one can imagine that Chinese New Year (CNY) celebrations are not “exactly” like those in mainland China. A shining example is the seventh day of CNY called Ren Ri or Human Day. It is also known as the common man's birthday and is celebrated, especially in Singapore and Malaysia, by getting together to eat the abovementioned Yu Sheng, a flavourful and colourful raw fish salad. The name Yu Sheng means 'raw fish' but a different enunciation of the same words has another meaning of 'abundant life'. So eating 'abundant life' at the start of the New Year is expected to bring abundance and prosperity throughout the year. This ceremony has become so popular that it is now held right through the Chinese New Year celebrations. So since Singaporean SBB’ers weren’t working through CNY right till Tuesday, Anna, head enthusiast of the group arranged for a CNY lunch party on Wednesday. Keeping my vegetarian preferences in mind, Linda, the lubricant that keeps SBB Singapore running smoothly, very kindly sought out a Chinese vegetarian restaurant “Linghzi” and booked the meal a day earlier. Terry, jovial as ever, a congested Chris (thanks to the super cold environment we work in) and me, rode out there in Terry’s very sassy blue car. When we reached there we saw ourselves at a classy place, filled with vegetarian Singaporeans celebrating the New Year with much vigour. Anna appeared a few minutes later, with a fresh flu and zest for life reduced in no way. We drank chrysanthemum tea and talked about a number of things ranging from the priciest cars in Singapore, to the time taken to travel to Johor Bahru in Malaysia, the meanings of CNY traditions and the effectiveness of acupuncture on weight loss. In the meanwhile, Linda called us to announce that she had lost her way and was trudging here through mean traffic. Anyway, no harm done, since we kept the Yu Sheng aside till she arrived. After she joined us, hassled, but smiling, we tossed the Yu Sheng while a waitress made a prosperity recital in Chinese. And then we dug in. I don’t know the exact names of what we ate, but I do remember I’ve never seen so much food on my table at one mealtime. It truly signified incoming wealth and abundance. We heartily waded through fish and meat made of tofu, a birds nest soup, stir fried vegetables with mushrooms, and olive rice and washed it all down with a brilliant dessert comprising of mango milk, with sago and grapefruit. We followed this with a visit to Anna’s house and met some of her family, including her daughter, her overjoyed dog, and three very curious guinea pigs. I also tasted some CNY pineapple tarts, but it was Anna’s Hong Bao to us, that made my day. We would have stayed longer, but unfortunately, stories were waiting to be written and sales were waiting to be completed. So we said our goodbyes and trudged back to the office. It sure was fun, dining and laughing with these people, who apart from being my colleagues, are fast becoming very good friends. I not only pray but foresee very good times ahead for the individuals, who make the company what it is, and as such, wish all of SBB from the bottom of my heart - Gong Xi Fa Cai!! !